For the third year running, WECHANGE is at EuropeLab, a forum for young professionals from the EU and Russia. Run by the organisation EU-Russia Civil Society Forum, EuropeLab always takes place in significant places of historical memory. This year, it is in the city of Piteşti, Romania. “You can call me the Prison Director” jokes Maria Axinte as she welcomes this year’s EuropeLab participants to the Piteşti Prison Memorial. In reality, she is the Director of the Memorial and Museum, one of only two in all of Romania commemorating the memory of prison camps in the original prison building themselves. Nowadays, the Prison Memorial in Piteşti is a short walk from the city’s high street, nestled in amongst a supermarket and blocks of flats. But it was not always that way. Before the city grew to encompass the complex, this prison was on the outskirts of the city, out of sight of many. Built between 1937 and 1941, Piteşti Prison housed both common law detainees and political prisoners, specifically students. The prison’s notoriety derives from the re-education experiment that took place in the complex from 1949-1951. The imprisoned students were subjected to relentless physical, mental and spiritual torture with the aim of breaking their resistance. The only way to stop the torture? To become an aggressor and torture their fellow prisoners. It is to the memory of this chapter in Romania’s history that Axinte and her team at Piteşti Prison Memorial dedicate themselves. 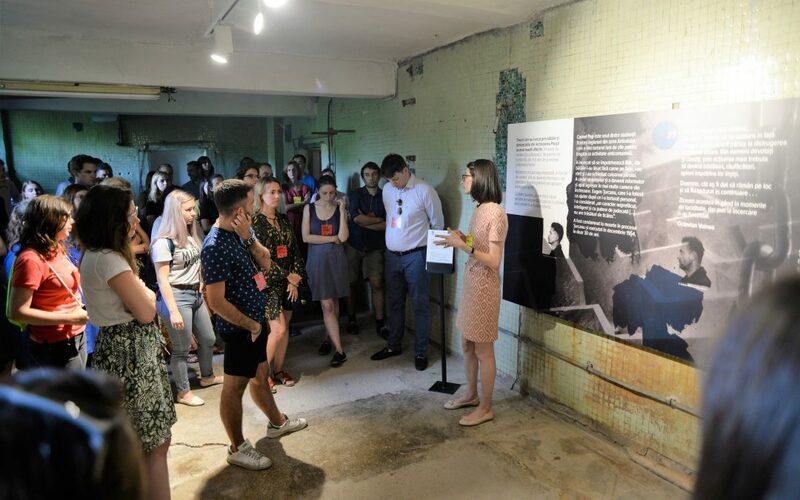 The museum and foundation opened in 2014, researching the history of anti-communist political detention and running educational and cultural projects. The museum actually only makes up part of the original prison complex, the other buildings serving as offices. There are no original objects in the museum, rather the exhibits tell the story of the space – the stories of those who endured the so-called “Piteşti phenomenon”. The stories told in the Prison Memorial are shocking and brutal. Yet there are stunning glimmers of humanity amongst stories of breakdown and abuse. One room of the exhibition is dedicated to the help some of the prisoners tried to give each other, such as sneaking a smile in the darkest moments. “You try not to tell the story as if they are victims, but rather as if they fought the system.” This by no means detracts from the brutality and shocking nature of the stories. On the contrary, it only strengthens their impact. What is it that keeps the team at Piteşti Prison Memorial motivated to keep exploring this traumatic past? EuropeLab runs this year 28-31 July with 60 participants from 12 different countries. WECHANGE is there for the whole event, documenting the forum and presenting the WECHANGE platform as a useful online tool for sustainable civil society cooperation.